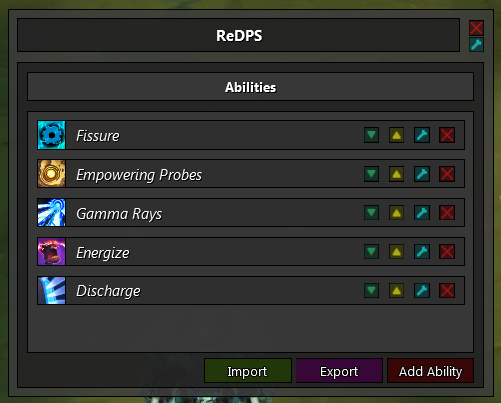 ReDPS is an addon designed to help players get used to their damage rotations. Currently in an Alpha state. The addon is designed to be used by anyone, but not without getting their hands dirty with some LUA first. Q: How do I create a ReDPS profile? A: ReDPS only takes LUA input, what this means is you have the full power of Carbine's API to do whatever you want. The downside is you will have to learn a little something before getting a working result. Q: Do you have any resources available to make things easier? A: Sure, look on below. Q: My profile isn't working for "insert class", can you help? A: I only play a Medic, I will also only help people at my own discretion. If you bug me chances are I won't. Q: I can't even "insert arbitrary task not related to functioning of addon here" with it, is this a joke? Down arrow shifts it down the priority list, up arrow shifts it up, the wrench brings up the ability settings window and the big red X deletes the ability from our list. I've provided several global functions to make writing conditions a lot easier, all you need to know right now is that when the conditions for your ability to be cast are met - you need to return true. ReDPS_isCooldown("abilityName") will return true if an ability is on cooldown, false otherwise. ReDPS_getCooldown("abilityName") will return the time left of an ability, 0 if the cooldown is done. 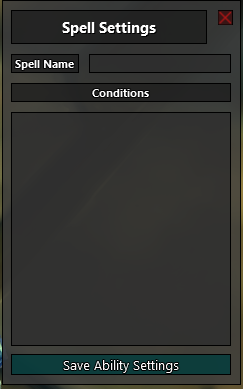 ReDPS_findAura(unit, "auraname") will return true if the aura is found, and false otherwise. Can be used with either ReDPS_player or GameLib.GetTargetUnit() as unit parameters right now. 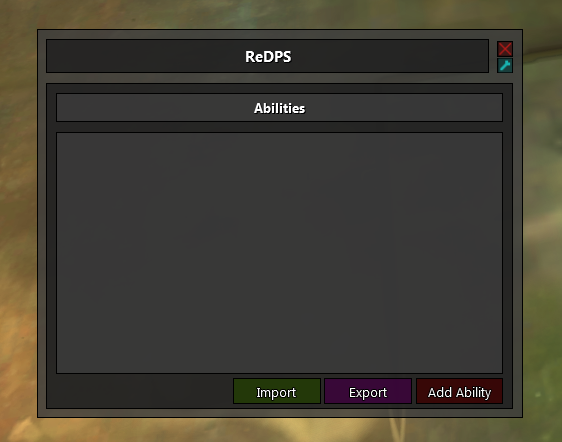 ReDPS_resource will return the amount of main class resource you have (Actuators, etc.) with the exception of suit power for stalkers. ReDPS_suitpower will return suit power for stalkers. ReDPS_focus will return the current focus amount. ReDPS_endurance will return the current endurance amount. It contains examples of every function being used, along with a few of the variables. If you're trying to develop a profile for another class and cannot find a function suitable for your needs please post what it is and I'll try to get implemented asap.